The East Timorese call their country Timor Lorosa’e which means, “Rising sun”. East Timor or Timor-Leste, as it is also known, is located on the island of Timor. The island is part of the Indonesian archipelago and lies between the South China Sea and the Indian Ocean about 400 miles northwest of Darwin Australia. East Timor is the first sovereign state of the 21st century. She shares the island with the country of Indonesia. The first arrivals to the island were the Vedo-Australoid people, related to the Sri-Lankans, sometime between 40,000 and 20,000 B.C. The Melanasian people migrated to Timor around 3000 B.C., and remain the largest ethnic group there today (Malay and Pacific Islanders). In Ancient Timor, they exported beeswax, spices and the highly sought after; fragrant sandalwood. The island was colonized by the Portuguese from 1600 to 1975. In 1613 the Dutch took control of the western portion of the island and fought for control of the whole island, until 1860, when a treaty was signed separating the two countries. In 1949, the Dutch recognized the western portion of the island as Indonesia. Just nine, short days after East Timor gained independence from Portugal, she was invaded by Indonesia, which began the next twenty five years of hell. It is estimated that 200,000 East Timorese lost their lives (nearly one-third of the entire population) due to war related starvation, disease and unspeakable massacres and atrocities. In 1999, the United Nation forces finally stepped in and allowed for an election. Eighty percent of the East Timorese people voted to secede from Indonesia and demanded their independence. They finally gained it May 20, 2002. During those twenty five years, seventy percent of all infrastructure was wiped out. Ninety percent of the schools and healthcare facilities were demolished. Even the fishing villages and boats were destroyed and so was their ability to fish, which provided the main source of food for the East Timorese people. Today the forests make up only one percent of the territory, thanks to slash and burn agriculture and deforestation. Much of the vegetation was eradicated during the Indonesian invasion, from the use of poisonous chemicals like Agent Orange. Needless to say, the East Timorese are still recovering from all this, albeit slowly. The country is now run as Parliamentary Republic and the “Head of State” is the president. East Timor is considered to be the poorest country in Asia. However, oil and gas recently discovered off shore, is the new hope of prosperity for this land and her people. Dili is the capital city and the main industries are printing and soap manufacturing. They grow coffee, rice, maize and cassava to export and they also export marble and their coveted, sandalwood. East Timor has a tropical climate with two seasons; a wet season, from December to April and a dry season, from May to November. The land is a rugged terrain, with Mt. Ramelau being the highest peak, at nearly 10,000 feet. They also have plenty of challenges from Mother Nature such as floods, earthquakes, landslides and tsunamis. Timor is located in what is called a tectonic subduction zone, where tectonic plates slide under one another creating instability and massive earthquakes. Since 1900, 212 earthquakes with a magnitude of 7.0 or more have occurred in the region (most beneath the sea) and with them tsunamis, on average, one tsunami every 14 months. The official languages are Tetum and Portuguese, however there are at least 12 local languages and many speak Bahasa Indonesia and some, English. Interestingly, their currency is the United States (US) dollar. They use US coins but also have the Portuguese minted centavos in the same denominations as US coins. As for religion, the majority of the people are Roman Catholic followed by Protestants, Muslims, Hindus and Buddhists. Their festivals and celebrations happen around Christmas and Easter and of course Independence Day. As we look into the cuisine of East Timor, the influences are clear. 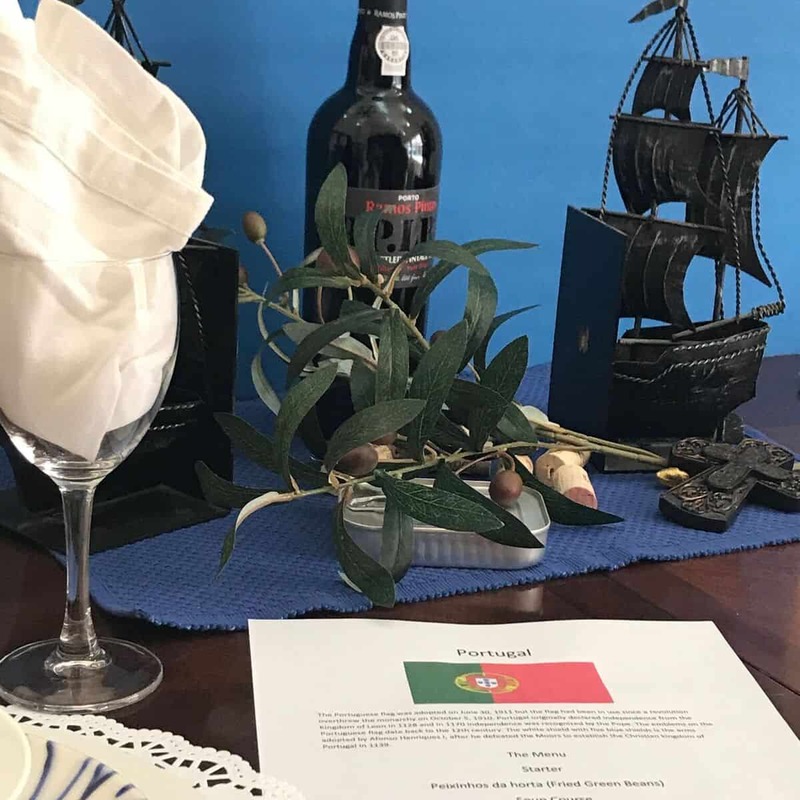 The Portuguese introduced their cuisine, as they were part of the culture there for almost 400 years. For example, feijoada is very well-liked. (Remember the bean stew, with beef and pork, from our journey to Brazil?) Indonesian cuisine is also popular, with influences from India and China. They like their food spicy and of course, the local ingredients found on and around the island are used as the main stays of the cuisine. Interestingly, rice is popular, however corn is considered the staple. 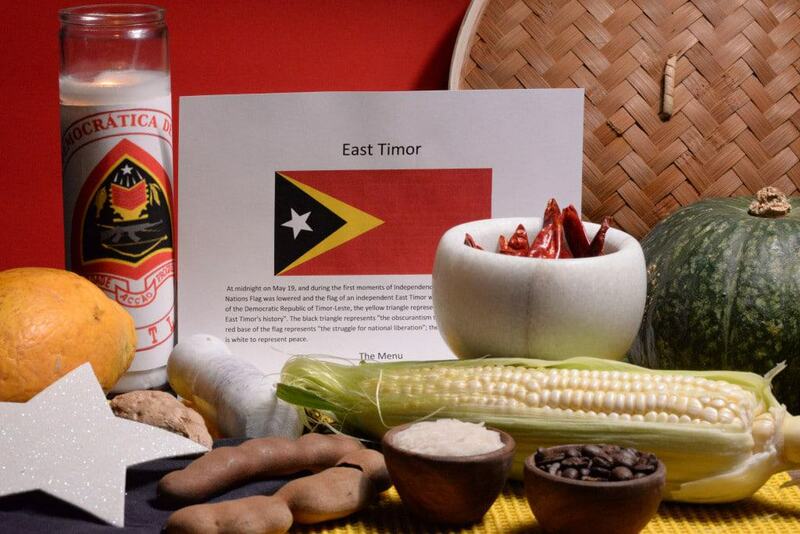 We set the stage for our East Timorese meal with the colors of their flag; red, yellow, black and white. The color white, represents peace and the star is considered to be “the light that guides.” We placed a small bowl of water on the low table, as it would be customary to wash your hands with it before eating. The East Timorese either eat with only their right hand or with a spoon and fork. The spoon is held in the right hand and the fork is used to push the food onto the spoon. 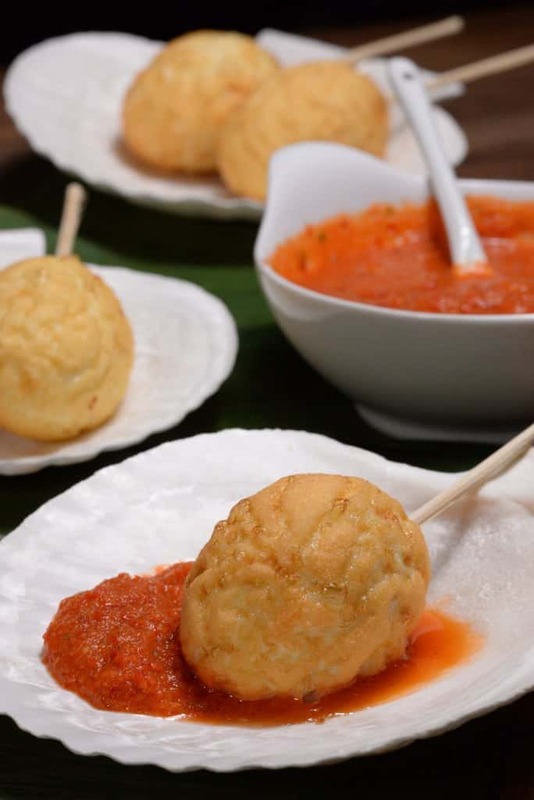 We began with an appetizer, which is a common street food found all over East Timor and usually sold by kids. It is a deep fried, hard-boiled egg which sells for 25 cents. The egg is served with a very spicy, chili paste. We never had a fried, hard-boiled egg before and the result was a nice, crispy touch to the outside of the egg. No batter was necessary, it does it all on its own. We loved them. The remainder of the meal was served family style. 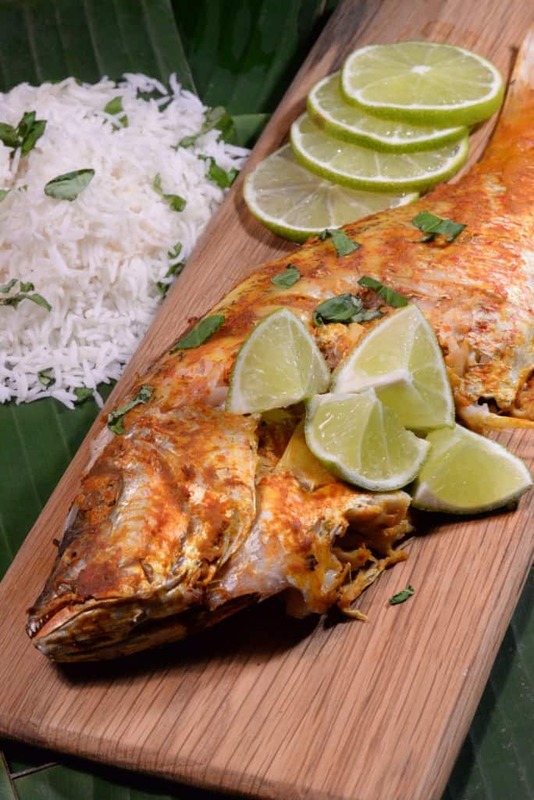 The whole, red snapper was seasoned with a curry made of spices and tamarind. The fish was first steamed in a banana leaf and then grilled. It was tender and perfect, served with rice, lemon wedges and another popular dish called, batar da’an. 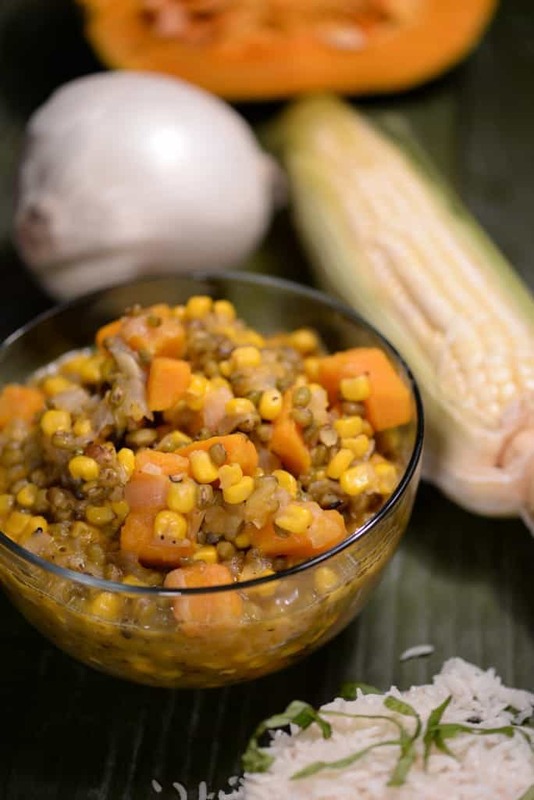 It consisted of corn, mung beans and pumpkin. This is a wonderful vegetarian dish that could easily be a main course all by itself. 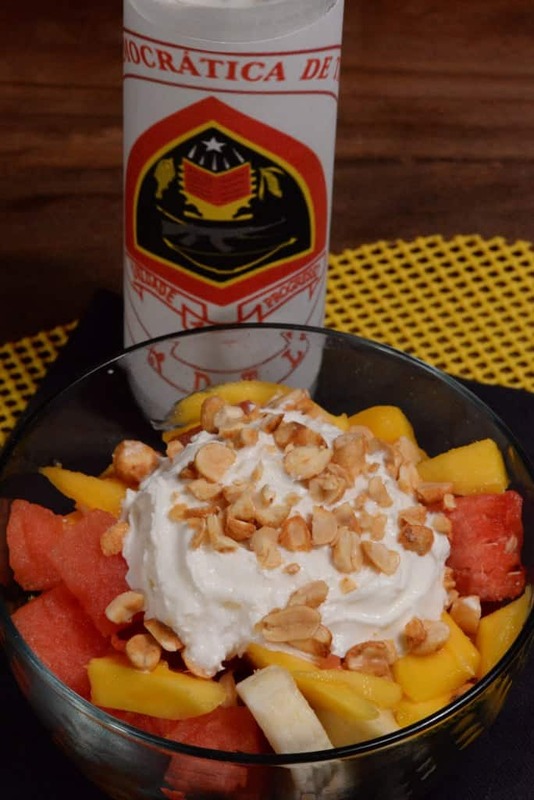 For dessert, we delighted in fresh fruit, served with cream and nuts. Drinks are not normally served before or during the main meal. However, we enjoyed a strong coffee with our dessert. When being offered a drink in East Timor, it should be received with both hands. 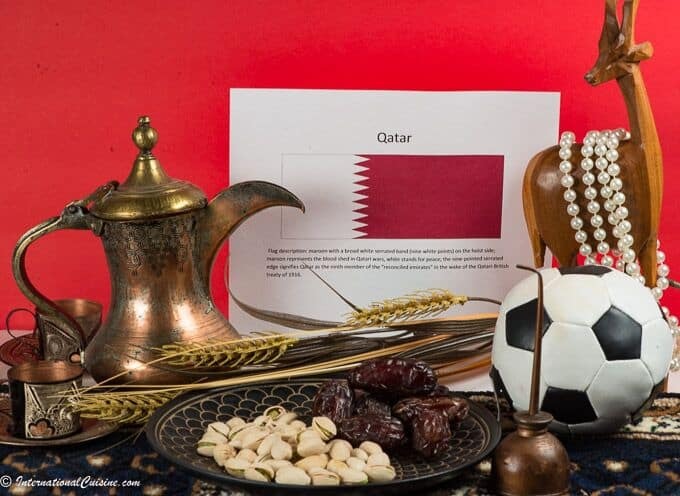 All food that is offered should be accepted as a gift and when you are finished you should leave a small amount of food on the plate, except that all the rice should be eaten. Then, place your fork and spoon face down on the plate, with the spoon crossed over the top of the fork. No one knows where it is, because no one knows. But my island is Pacific, not the Orient. The mountain ranges, peak to peak. where one marvels, and be inspired. My mountains are just plain mountains. When you look, you look at mountains because they are mountains…. because no one knows where it is. As we say goodbye, I am happy to say, yes, we now know of this country, East Timor!